So up I went the Marathon Steps. …but eventually I made it all the way up to Marathon Road. A moment later, I turned north onto Darling Point Road and began my walk around Darling Point. Back in 1993-1995 I lived in Rushcutters Bay with my eldest sister and her partner. 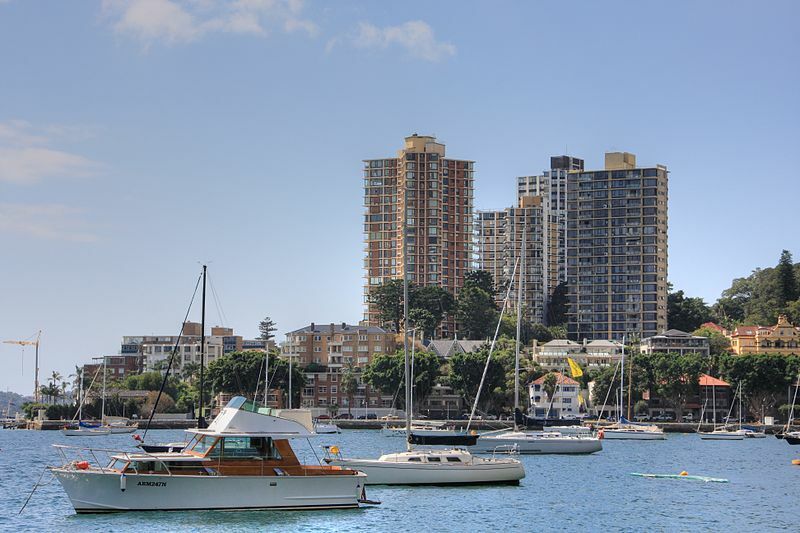 We’d often drive to neighbouring Edgecliff to do our grocery shopping, and as we did I’d often glance past Rushcutters Bay Park to Darling Point and wonder what it was like over there. Like the other suburbs I’d walked through that day, Darling Point is affluent – but of them all, I liked it the most because it was especially cozy and leafy. As well, it was even more quiet than Point Piper. Walking around Darling Point was a pleasant way to unwind after the Marathon Steps. Eventually, I came around to the western side of Darling Point where it joins Rushcutters Bay. …but not only was I starting to feel the effects of my walk, and realising that getting to the Opera House was perhaps too far, but another unexpected development had arisen. I thought about what to have for dinner, and soon one idea became very appealing: a margherita pizza and a bowl of Italian slaw washed down with a jug of diet cola at Star Bar, one of my regular haunts in the Sydney CBD. Star Bar was at least a further 30-45 minutes away, if I took a direct route there. So instead of bearing north-west through Rushcutters Bay Park I instead went south-west to follow Bayswater Road up into Kings Cross. After the Cross I descended west along William Street to where it joined Park Street, and I ascended my last big hill for the day through Hyde Park to finally enter the CBD. By 6pm I made it to Star Bar where I officially declared my walk over and ordered my dinner. And just as I had hoped, it tasted wonderful. My second Sydney long-walk for 2014 was another success. Already, I was looking forward to my third possible walk on the weekend of 16-17 January – partly because it would also be after my first week back at work. I wasn’t expecting my work-week to be horrible, but having something major to look forward to next weekend was a big plus. So as I had dinner and relaxed at Star Bar, I began thinking about where a third walk would take me. And soon, I decided where.